Jones, Geoffrey P., and McCormick, Mark I. (2002) Numerical and energetic processes in the ecology of coral reef fishes. In: Sale, Peter S., (ed.) 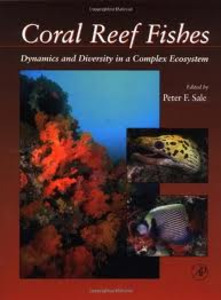 Coral Reef Fishes: dynamic and diversity in a complex ecosystem. Elsevier, San Diego, CA, USA, pp. 221-238. [Extract] One of the most fundamental tasks in ecology is to explain why populations behave the way they do (Royama, 1992). Despite many years of research on population dynamics there is little consensus, not only over the answer to this question, but also as to exactly what the question is (Turchin, 1995, 1999; Wolda, 1995; den Boer and Reddingius, 1996; Murray, 1999). When populations are highly variable, researchers will naturally ask why they vary (Sissenwine, 1984). If they remain relatively constant, it is more likely that they will ask why they do not vary (Lack, 1954). In the rarer instances when populations exhibit cycles of abundance, then the challenge is to determine what generates regular fluctuations (Boonstar et al., 1998). The exact question we ask and our initial assumptions can have profound effects on the research programs that we establish, the variables we measure, and ultimately the processes we identify as important. Although population ecologists broadly seek an explanation of numerical patterns, the underlying processes may at first sight have very little to do with numbers at all. A comprehensive explanation of numerical patterns will require an assessment of all the processes that act directly or indirectly to determine the number of individuals in the population.